The Prop Den • Where to get screen accurate ESB E 11? Post subject: Where to get screen accurate ESB E 11? or greeblies for a ESB E 11. Also i'm happy for each reference pic. Should be made of Resin, painted, unpainted, complete or as kit. Also the blaster should have a M 19 scope, not a M38/M40. I ask John " Stormtrooper" for his screen used Resin Cast, but till jet no answer. Thank's for all infos here in this thread or via PM. Last edited by Turrican on Wed Mar 17, 2010 2:28 pm, edited 1 time in total. Post subject: Re: Where to get screen accurate ESB E 11? I think tango'd fett does blasters. He is a mod on the replica prop board and he is on the RPF. Thanks , i wrote him a PM. So ..looking if i get an answer. You do know that one u posted is not screen accurate the greeblies are wrong.. It's 100% authentic, just not screen used. It was used in the ESB promo pictures. The background ESB blasters were all made out of resin and had those greeblies on them. They were used for the troopers way in the background of a shot. 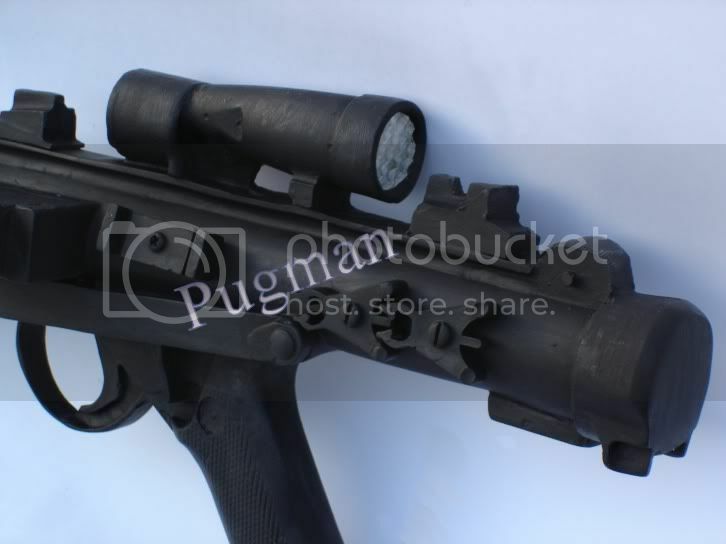 However the “hero” blasters were made from real Sterlings and looked like the ANH blaster sans the cylinders on the top of the ammo magazine and the Hengstler Counter. I think you might be thinking of the RotJ blasters which indeed had different greeblies on them. So if the "hero version" was the same as the "stunt version " in AnH, i can try to get a doopydoos E 11. Cause it's a copy of a real sterling mp. The only problem would to get a M19 scope. As you can see here , there is no M 38/ M 40 scope mounted on the rail. You are right im thinking of the one with the winchester hammer greeblies DOH! Still searching a M 19/M32 scope. Looked in the RPF, Ebay, Egun.. found nothing. Wrote Blast-Tech mails, no response. It should be screen accurrate with all marks, not self build. But thank you all for your help and infos! Didn't think eBay allowed auctions with real guns!? A real deact. Sterling would be nice. But hard to get here in Germany....realy hard. And i not want to take the risk to buy one from outside Germany. Of course it would be very funny, to see the mien of the tollkeeper .lol. Will show pic's of the kit , if it's arrives me. Nice M19 casting , how much are these if you dont mind asking ? This guy used to sell on e-bay a while back i think. Did you request this as a special order , he doesnt list them on his site?